Richmond airport in 1984 when it was the fourth largest airport in Virginia at the time. In 2017, the airport served 3,657,479 passengers, an all-time record for the airport and broke its previous record of 3,634,544 back in 2007. RIC is served by airlines flying primarily domestic routes to cities in the South, Northeast, and Midwest, and connecting flights to major hubs for international destinations. In 2016, RIC reported its 32nd consecutive month of growth, with an estimated 345,000 travelers reported in October 2016. Several airlines serving RIC have responded to growing demand and traffic with upgraded routes and aircraft. Delta Air Lines, JetBlue Airways and Southwest Airlines have added additional existing routes and larger aircraft in 2017. United Airlines up-gauged its Denver service to a mainline aircraft, replacing the Embraer E-175 used with United Express. It is the longest and most westerly flight originating from Richmond, surpassing American Airlines' Dallas/Fort Worth service. In the early 2000s Richmond saw another period of extensive growth, and in 2005 it announced a complete redesign of the airport. 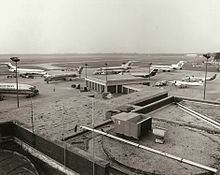 RIC went from a single story terminal with 12 gates to 22 gates (plus numerous non-jet bridge gates), added parking spaces (to 10,500), and created a new terminal roadway and air traffic control tower. The project features major renovations of the terminal building, including upper-level departures and lower-level arrivals, the construction of a central utility plant, and the widening of security checkpoints. Construction on the renovated two-level terminal was completed in spring 2007, and was designed by Gresham, Smith & Partners. Due to recent growth Richmond has reopened its international gate (B15) for flights to Cancun, Toronto, Punta Cana, all of which are seasonal services. In 2016, Richmond International Airport handled over 63,000 tons of cargo, an all-time high. Cargo services offered at the airport include more than 100,000 square feet (10,000 m2) of warehouse/office space and 1,000,000 square feet (100,000 m2) of apron space. The airport is designated a Foreign Trade Zone. Because of its position on the Eastern Seaboard, cargo transit via RIC is on the rise. Goods shipped out of the metropolitan Richmond area can reach 72% of the U.S. population within 24 hours. The April 1957 Official Airline Guide lists 43 weekday departures: 22 on Eastern Air Lines, ten on Piedmont Airlines (1948-1989), five on American Airlines, four on National Airlines and two on Capital Airlines. In 2017, the airport served 3,657,479 passengers, an all-time record for the airport and broke its previous record of 3,634,544 in 2007. 2017 was also the airport's fifth consecutive year of growth and experienced a passenger traffic increase of 2.8% over passenger traffic reported in 2016. 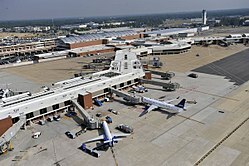 RIC is the third-busiest airport in Virginia, after Washington Dulles and Ronald Reagan Washington. On July 19, 1951: Eastern Airlines Flight 601 bound from Newark to Miami suffered severe buffeting after an access door opened in flight over Lynchburg, Virginia and the crew decided to divert to Richmond. A flapless wheels-up landing was made a few miles short of the runway at Curles Neck Farm because the crew feared that the aircraft would disintegrate before they could get to the airport to attempt an emergency landing. There were no fatalities. On November 8, 1961: Imperial Airlines Flight 201/8 was destroyed when it crashed and burned following an attempted emergency landing at the airport, all 74 passengers, and three of the 5 crew members died. On June 9, 1996, Eastwind Airlines Flight 517 from Trenton, New Jersey, experienced loss of rudder control while on approach to Richmond; however, control was regained shortly after, and the aircraft landed normally. There was one minor injury. In 2011, a private twin engine, Piper Navajo, crashed after take-off. Only the pilot was on board at the time of the crash. The pilot suffered burns and was immediately taken to a hospital. Until October 2007, the 192d Fighter Wing (192 FW), an Air Combat Command (ACC)-gained unit of the Virginia Air National Guard, maintained an Air National Guard station, operating F-16 Fighting Falcon aircraft from the airport. In late 2007, pursuant to BRAC 2005 action, the 192 FW relinquished its F-16C and F-16D aircraft and moved to Langley AFB (now Joint Base Langley-Eustis), to integrate with the Regular Air Force as an associate unit to the 1st Fighter Wing (1 FW) flying the F-22 Raptor. ^ "Richmond International Airport Aviation Activity Report" (PDF). Archived from the original (PDF) on March 5, 2017. Retrieved February 19, 2016. ^ "Capital Region Airport Commission - Richmond International Airport". www.flyrichmond.com. Archived from the original on June 23, 2017. Retrieved June 21, 2017. ^ John Pike. "Richmond International Airport / Byrd Field". Globalsecurity.org. Retrieved November 15, 2013. ^ "Airport Design, Architecture and Interior Design – Gresham, Smith and Partners". Showcase.gspnet.com. Archived from the original on December 2, 2013. Retrieved November 15, 2013. ^ Zullo, Robert. "Expansion at Richmond International's Concourse A on the horizon". Richmond Times-Dispatch. Retrieved 2017-10-11. ^ "News - Richmond International Airport". www.flyrichmond.com. Archived from the original on 2018-02-02. ^ Richmond Times-Dispatch, ELLEN ROBERTSON. "Anthony E. "Tony" Dowd, who helped put the "international" at Richmond's airport, dies at 90". Retrieved May 19, 2018. ^ "Terminal Building, Richard E. Byrd Airport, Richmond, Virginia: Rarely Seen Richmond". Virginia Commonwealth University. Retrieved November 15, 2013. ^ "History". Capital Region Airport Commission. Archived from the original on March 8, 2016. Retrieved January 22, 2015. ^ "Allegiant Air". Retrieved 7 January 2017. ^ a b "Flight schedules and notifications". Retrieved 7 January 2017. ^ a b "FLIGHT SCHEDULES". Retrieved 7 January 2017. ^ "JetBlue Airlines Timetable". Retrieved 29 January 2017. ^ "Check Flight Schedules". Retrieved 7 January 2017. ^ "Where We Fly". Spirit Airlines. Retrieved 7 January 2017. ^ a b "Timetable". Retrieved 7 January 2017. ^ "RITA | BTS | Transtats". Transtats.bts.gov. Retrieved June 21, 2015. ^ "Aircraft accident Eastern Airlines DC-7B, Richmond, VA". Aviation Safety Network. July 16, 1964. ^ "Aircraft accident Learjet 23 N866JS, Richmond, VA". Aviation Safety Network. May 6, 1980. ^ "Aircraft accident Boeing 737-2H5 N221US Richmond, VA". Aviation Safety Network. June 9, 1996. Archived from the original on October 21, 2012. ^ "Plane Crashes at Richmond International Airport – WRIC Richmond News and Weather". Wric.com. November 9, 2013. Archived from the original on December 3, 2013. Retrieved November 15, 2013.